Will we see this scene repeated on Sunday afternoon? "France are used to winning and won't be overawed in any way and their pace is going to frighten Croatia. When the French break on the counter-attack they are going to be very dangerous. 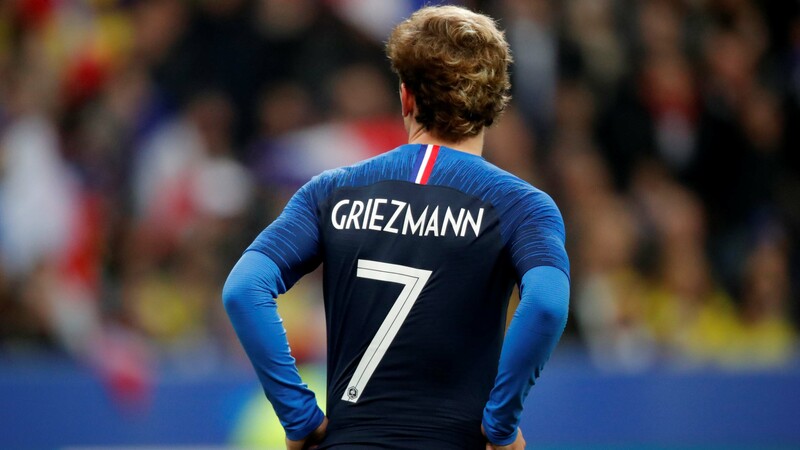 Croatia may see more of the ball but Didier Deschamps' side have the edge in attack and my prediction is a 2-0 France win with Griezmann getting on the scoresheet." We may have lost on Wednesday night but you have to be happy with England's World Cup. No-one believed it was possible for us to reach the semi-finals before the tournament so we have far exceeded expectations and for a moment it seemed that England's football had made everyone happy. I was gutted to lose the semi-final. After the last-16 win, then getting through the quarter-final I - and plenty of others - was thinking 'this actually could happen'. You get carried with it and I was like everyone else. I'd started to fantasise about the final. We are entitled to get carried away, we haven't had many chances to do that in recent years, so why not? I would have been happy with a quarter-final before the tournament so to get that close has to be celebrated! Midfield is an area where there could be room for improvement. I think we saw that against Croatia. Their midfield dominated ours and they outclassed us. We need to retain the ball against the better teams. We played some lovely stuff against the more mediocre sides but we were unable to change our game against Croatia, a very good team, and we struggled. But now is not the time to nitpick. We still need to ride that wave of enjoyment and reflect on what it meant to us as a nation. We've got our belief back! I'm not even thinking about the Euros yet, let's just enjoy the World Cup and look to start the next campaign in the same vein. Players will be looking ahead of course, especially those outside the squad and I do feel that young players will be inspired by the setup and the manager's approach, and they will know that if they play well they could get their opportunity with the Three Lions. Southgate has learned loads, too. He now knows which players can perform at a tournament. He has developed a style of play that he is trying to implement and improve. Goals and chances were a little hard to come by and I'm sure Gareth will be working on that. But there are many positives in this team - the mentality, the ambience in the squad seemed to be right, there was a clarity to his workings. I performed better when there was that clarity and responded to that, and I think these players are the same. Southgate got it right in so many ways and I am looking forward to watching this squad grow and develop over the next few years. I just thought physically they wouldn't be able to do it, but their greater experience and class told over the course of the match. Unlike England, France can match Croatia for experience, and they have elite players who perform at the biggest clubs who have won the biggest prizes, too. Raphael Varane has lifted the same Champions League trophies that Luka Modric has at Real Madrid. Antoine Griezmann has won a Europa League with Atletico Madrid, Paul Pogba has tasted league success in the Serie A with Juventus, N'Golo Kante has won back-to-back Premier League trophies, Kylian Mbappe has just done the same in France. So France are used to winning and won't be overawed in any way and their pace is going to frighten Croatia. When the French break on the counter-attack they are going to be very dangerous. Croatia may see more of the ball but Didier Deschamps' side have the edge in attack and my prediction is a 2-0 France win with Griezmann getting on the scoresheet. But before that we have the third-place playoff of course. It's not a game that would have particularly excited me - although as a professional I always played to win - and I'm sure England will want to go out on a positive note. I don't know about Belgium's lineup, but I think Southgate might rest a few of those who have served us so well and give a taste of World Cup football to some of the younger players. Kieran Trippier looked in trouble at the end of the Croatia game and Trent Alexander-Arnold will probably come in there. Ruben Loftus-Cheek may start in midfield again. It's a tough game to predict but I suspect Lukaku will get at least one goal in a 2-1 Belgium win.